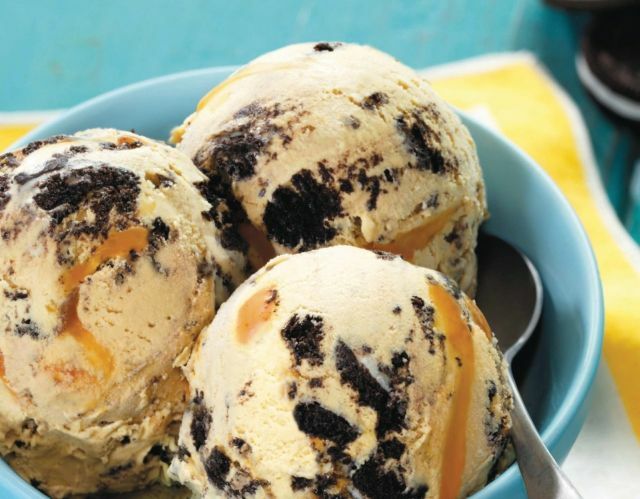 Baskin-Robbins welcomes spring with new Oreo 'n Caramel ice cream as the 2018 March Flavor of the Month. The new flavor features salty caramel ice cream and Oreo cookie pieces swirled with caramel. As usual, you can get it in a cup or cone as well as part of a milkshake, Cappuccino Blast, or sundae. For those looking to get into the spirit of St. Patrick's Day, the chain offers a St. Patrick's Day Cake that's decorated with green icing, a rainbow, and a pot of gold. They will also be giving free samples of Mint Chip 'n Oreo Cookies Milkshakes on Saturday, March 17, 2018, from 3 PM to 7 PM, at participating stores nationwide. If you're looking forward to Easter, Baskin-Robbins debuts the new Bunny Stripe Cake, which features a chocolate bunny on a pastel-striped cake that can be made with any ice cream flavor plus a choice of white or chocolate cake. At the end of the month, on Saturday, March 31, 2018, participating locations will offer all regular and kids-sized scoops for $1.50 each.